When you want to use the text or the image contents in your PDF document, you may be vexed by the good PDF security ability which results in that you can not freely copy, modify, etc. the PDF contents. But if you have VeryPDF PDF to Word Converter, all of these questions will be resolved because this application can accurately export the content or the original PDF content in the conversion from pdf to word. You can download the free trial version of the application via clicking the following link: http://dl.verypdf.net/pdf2word.exe. It is a setup file and you need to double click it and follow the popup installation wizard to install the application on your computer. For you work convenience, you can create a desktop icon for the application. 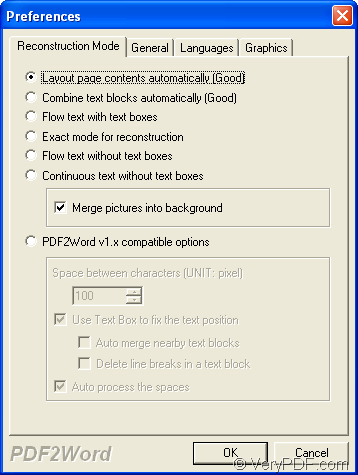 Then please double click the icon to open PDF to Word Converter and then you will see a small window of the application. Please see it in Figure 1. You need to open the PDF document in the application. Two ways are given and you can choose any one of them. The first one is to directly drag the PDF document and drop it in the application. The second way is to click “File”—“Open” for opening “Open PDF Files” dialog box where you can select the document you want to convert. After adding PDF document, “Preferences” dialog box will pop up immediately, in which there is a Tab Control that contains four Tabs. In “Reconstruction Mode” Tab, there are six kinds of mode for you choosing to reconstruct your pdf to word document. 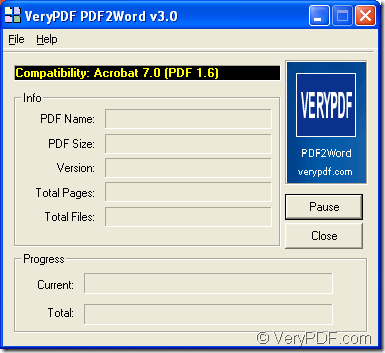 For obtaining the detailed information about each mode, just read the user manual of PDF to Word Converter at http://www.verypdf.com/pdf2word/help/help.html. 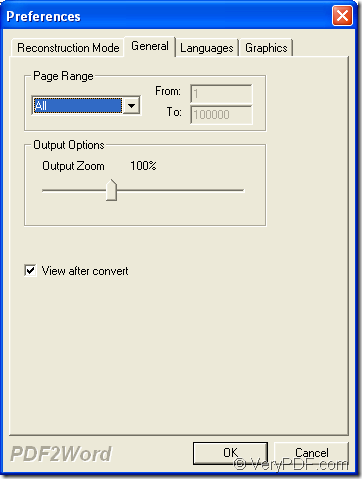 In “General” Tab, you can easily set the page range that you need to convert for the input PDF document. Just customize the page number in “From” and “To” boxes after you check “Selected Pages” option in the dropdown list of “Page Range” group box. In “Output Options” group box, you can use the drag bar to set percentage size for converted DOC file. 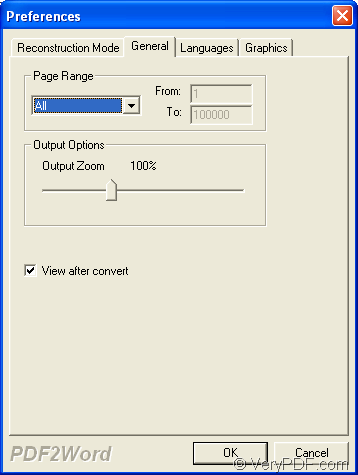 If you check “View after convert”, the target file will be automatically displayed instantly after the conversion. In “Language” Tab, you can choose “Auto” or “English Document” to auto recognize and process the character set from pdf to word document conversion or convert your PDF document to pure English document. In “Graphics” Tab, you can choose to delete all graphics from the result Word document or delete all pictures from the result Word document via checking “Delete All Graphics (Line, Arc,etc. )” or “Delete all Pictures” option. Then please click “OK” button and “Save as” dialog box will pop up. Please choose a location for the output file in “Save in” dropdown list, input the name for the target file in “File name” edit box and choose the output format as “Word Files (*.doc)” in “Save as type” dropdown list. 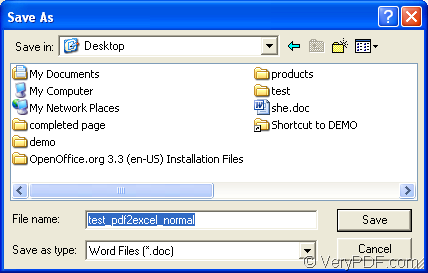 Click “Save” button to run the conversion and the basic information of the PDF document and the progress of the conversion from pdf to word will be shown in the main window of PDF to Word Converter. 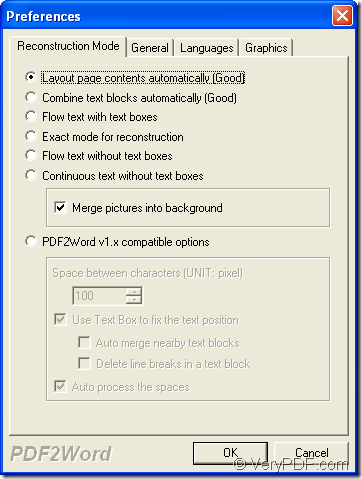 Please see “Save as” dialog box in Figure 4. You can pause or resume the conversion anytime. You can also stop the conversion. 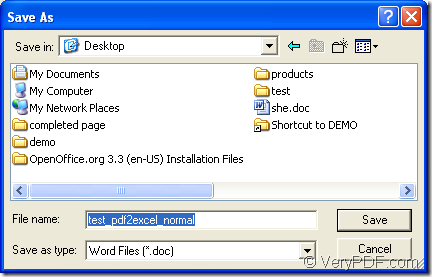 When the conversion is over, the converted Word document will pop up immediately if you have chosen to view the target file after the conversion. For buying the application, you can get into the its homepage at http://www.verypdf.com/app/pdf-to-word/index.html.